TAG LINE: Every city has a place where sins are buried. Leaving the truth to be unearthed. LOG LINE: A homeless drifter retreats to a local cemetery to confront his past demons but gets drawn into a fight for survival when he witnesses two armed men attempting to bury an unconscious immigrant girl near the grave of his departed fiancée. 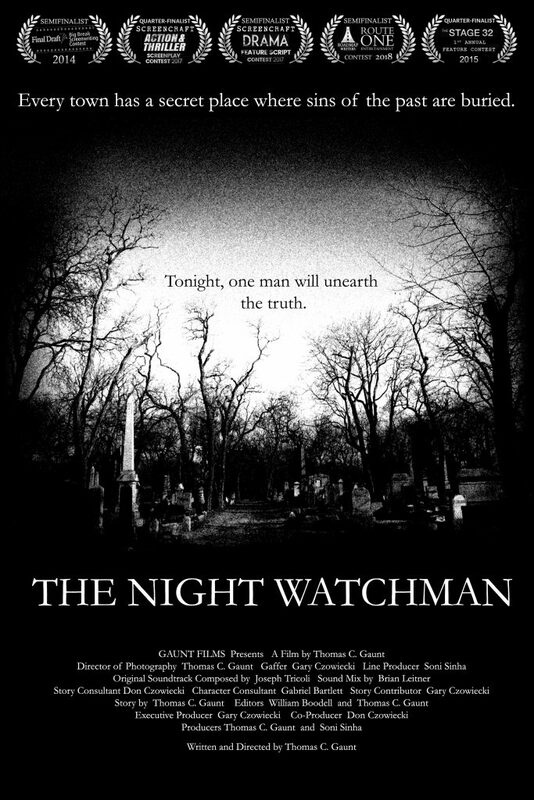 THE NIGHT WATCHMAN made it to the 2nd Round of the highly competitive Drama Feature Screenplay Category in the 2018 Austin Film Festival Screenplay Competition and was in the top 20% of nearly 10,000 entries. Our screenplay was also named a Quarter-Finalist in the 2018 ScreenCraft Screenwriting Fellowship, a Semifinalist in the 2018 Roadmap Writers/Route One Entertainment Contest, a Semifinalist in the 2017 ScreenCraft Drama Feature Script Contest, a Quarter-Finalist in the 2017 ScreenCraft Action/Thriller Screenplay Contest and a Finalist in Robert Rodriguez’s ‘Rebel Without A Crew’ TV Show. Originally titled AMONG THE DEAD, earlier drafts of THE NIGHT WATCHMAN were named a Semifinalist in the 2013 Final Draft Big Break Screenwriting Contest, a Quarter-Finalist in the 2014 Chicago Screenwriter’s Network Contest, a Quarter-Finalist in the 2015 Stage 32 Feature Contest, placed in the Top 10% of the 2013 Script Pipeline Screenwriting Competition and placed in the Top 20% in the 2013 Academy Nicholl Fellowships.